Many well-known indie artists and entertainment professionals got together October 14th to pay homageto one of their own that has made a name for themselves in a major way. K.O.V.E has a portfolio as long as his line of supporters. He has participated in countless MC battles, walking away with the title several times. He has also opened up for many mainstream acts including but not limited to: Big Sean, French Montana, Pastor Troy, etc. 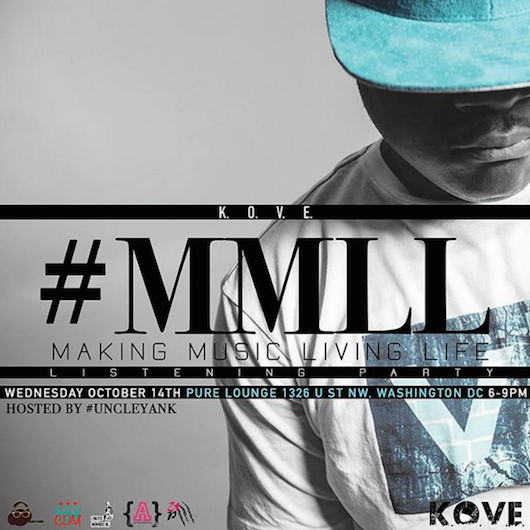 K.O.V.E has graced many DMV venues over the years with hype performances.This time he is giving listeners an actual piece of his heart and soul in his new mixtape entitled: Making Music Living Life. That is exactly what K.O.V.E is doing. K.O.V.E has taken such a simple phrase, “Making Music Living life” and given it so much meaning. When a musician creates, they give you a sneak peek for their lives. The rises and falls, the joys and sorrows are there behind every word, note and inflection. K.O.V.E has utilized memories of a difficult childhood to fuel his ambition for success. Rather than succumb to circumstance he has realized the gifts he has for creating music and used them to travel, perform and make his mark on the world. Drawing reference from greats such as KRS One and Rakim, K.O.V.E has a raw gritty sound reminiscent ofHip-Hop in its early and purest state. Music has always been his saving grace as well as his home and his stage presence shows how much comfort it has given him. Whether he was turning up or spitting knowledge the passion was genuine and sincere. Supporters packed Pure Lounge DC eager to hear what this project had to offer. What they got was a high energy performance and the skilled lyrics of a true wordsmith over clean production. Added bonuses were the visual elements of his videos playing during his live performance. For more information on K.O.V.E as well as show dates and new music check out his website: www.thatdudekove.com and make sure you download the Making Music Living Life mix tape ASAP for allthe real Hip-Hop lovers out there.